If you see a swarm of honeybees anywhere in South Devon, call one of the above numbers and one of our team will collect it and safely house it. For other locations in Devon, see the list of numbers on the right of this page. PLEASE NOTE: we are beekeepers, NOT pest controllers. This service is carried out by experienced beekeepers and is free of charge for domestic premises, if the swarm is outdoors and accessible without special equipment. If the swarm is inaccessible, or inside a building or a chimney, please discuss the circumstances with us before we visit. There is a call-out charge of £25 for ALL NON-HONEYBEE removals and for swarm removals where the swarm has moved on before we arrive and we have not been notified. If the bees are NOT honeybees (e.g. bumblebees, mason bees) we will do our best to safely remove and relocate the nest, but there will be a charge of between £25 and £50 depending on the amount of work involved. We charge a call out fee of £45 for commercial premises. Removal work will be charged at £25 per hour. Before calling us, please check here that you have honeybees! If you see a swarm of honeybees, don't panic! When bees swarm, they are simply looking for a new place to live, and are very unlikely to sting you. You may see them clustering on the branch of a tree, or sometimes under eaves or on a fencepost, in Devon and Cornwall, any time between early April and late July, but most often in May and June. If you see a bee swarm in a reasonably accessible place and want it removed, call the local swarm line and we will put you in touch with a beekeeper who can safely take the swarm. This is a free service to householders, although we do appreciate a donation to Friends of the Bees to help us maintain this facility. If any structural work is involved in removing bees, or they have made a nest in a wall or other part of a building, or bees have already made a nest in your attic or other enclosed space, an assessment will be made before any work commences and you will be asked to agree terms for removal. Bumblebees DO NOT SWARM and live in relatively small groups. If you find a bumblebee nest, if at all possible, leave them alone. They are not likely to sting anyone unless they are disturbed, and then they will defend their nests.See this web page for more advice. Please note: beekeepers will not usually be willing to remove wasps or bumblebees. If you call out a beekeeper and you are found to have wasps rather than honeybees, they may make a charge for their time. Wasps have distinct yellow and black stripes, and do not form swarm clusters. Wasp and hornet nests are similar, having a light brown, papery appearance. 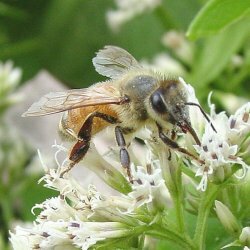 Honeybees are generally darker than wasps, with black, brown and sometimes orange stripes. When they swarm, they form dense clusters, often on tree branches or shrubs. This page will help you identify the most common species in the area.